In its glory days, the Pontchartrain Hotel in Detroit, affectionately referred to by locals as the Pontch, played host to presidents, Motown stars and executives of the auto industry that fueled the city's economy. In 2009, the legendary hotel fell into foreclosure after years of mismanagement. From then on, it stood barren, hovering over the skyline as a constant reminder of how easily fortunes can turn in the Motor City. It's a familiar story in Detroit, which this month became the largest U.S. municipality to file for bankruptcy protection. Just like the city, the Pontch is trying to make a comeback, this time as the Crowne Plaza Detroit Downtown Convention Center, a 25-story, 367-room hotel that opened July 18 with more than 10,000 square feet of meeting space, two restaurants, a lounge and an upscale café. 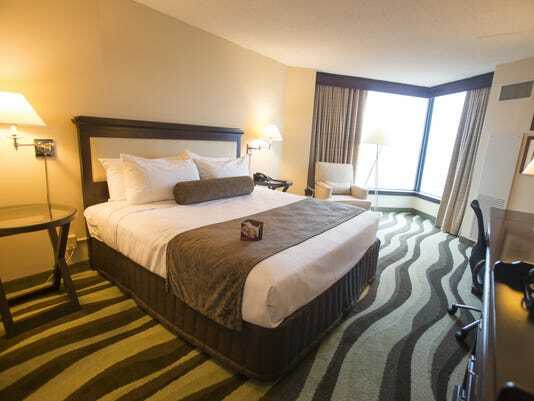 Detroit might be in bankruptcy, but its hotel industry is on an upward trajectory. Three casino hotels have opened in recent years. A new Starwood Aloft hotel is set to open next year in a landmark building in Grand Circus Park downtown. And developers have proposed turning a historic firehouse across from the Cobo Convention Center into a boutique hotel. The Cobo Center itself, home to the annual North American International Auto Show, is undergoing a $290 million renovation, which tourism officials hope will attract more conferences and business travelers when completed at the end of 2014. Other private investment in downtown and midtown Detroit by such business leaders as Quicken Loans owner Dan Gilbert is also revitalizing those areas. Gilbert has snagged more than 7 million square feet of property downtown, with plans to develop cafes and other attractions. And through a public-private partnership, a new 18,000-seat arena for the Detroit Red Wings has gotten the green light in midtown, with an accompanying entertainment district. Tech start-up companies have also emerged on the scene, luring young employees and entrepreneurs. And General Motors, which is headquartered downtown, is also stepping up its hiring as demand for new vehicles grows. All the activity has led to a budding arts and music scene. Michael O'Callaghan, chief operating officer of the Detroit Convention and Visitors Bureau, says demand is already strong for hotel rooms, even without the revamped convention center. Hotel occupancy rates in the metropolitan Detroit area have gone from 47.5% in 2009, when General Motors and Chrysler filed for bankruptcy protection, to 61.3% so far this year, according to hotel industry tracking firm STR. That's in line with the national average. Last month, hotel occupancy levels reached 70.3%.